All Sales are final once it ships - Product exchange Only. It takes a few minutes to load depending on computer speed. Exotic African Cuisines made simple by Kunmi Oluleye, author of Life with Wal-Mart: A Vendor’s Story and Selling My Food To Supermarkets, Distributors, Etc.. This DVD is entertaining as well as educative. 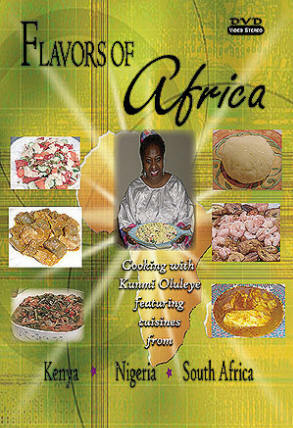 There are trivia questions to reveal the African country’s cuisine to be prepared. Kunmi takes you shopping for ingredients at various locations, prior to cooking in the kitchen. Get Step-by-Step cooking instructions and Nutrition information on various Foods. Watch Kunmi’s daughters ages 7 & 11 help with the cooking in the South African segment. No prior African or any other type of cooking experience required. An educational gift for anyone! This is the first of 17 DVD series featuring mouth-watering recipes. This DVD focuses on Kenya, Nigeria and South Africa. A great video for all ages.